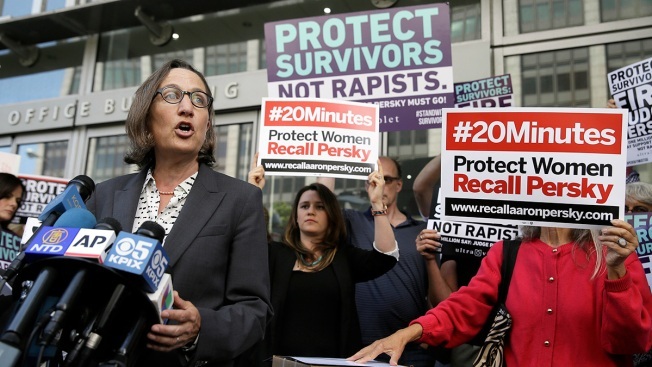 In this June 10, 2016, file photo, Stanford law professor Michele Dauber, who publicly represents the woman sexually assaulted by former Stanford swimmer Brock Turner, speaks at a rally in San Francisco. A Stanford University law school professor who spearheaded a California judge's recall over his handling of a sexual assault case is launching a political action committee to target politicians who commit or ignore sexual misconduct. The Mercury News reports Michele Dauber on Monday launched a PAC to target politicians across the country who don't take violence against women seriously or who have committed sexual misconduct themselves. The Enough is Enough Voter Project will aim to block lower-level politicians from ascending to higher office. Dauber led a campaign that ended with the ouster by voters of Judge Aaron Persky, who gave a six-month sentence to former Stanford swimmer Brock Turner. Turner was convicted by a jury of sexually assaulting an unconscious, intoxicated woman outside a fraternity party on the Stanford campus.